Mud Agitators mix and agitate the drilling mud that is used to prevent solid particles from depositing in the circular tank. This is also used to stabilize the work of drilling fluid. The Impeller shaft present in the mechanical Agitator transforms mechanical power into fluid circulation. The Mud Agitator can be obtained from the Mud Agitator Manufacturer in India and are generally available in horsepower such as 5HP, 7.5HP, 10HP, 15HP, 20HP, 25HP and 30HP. Please contact us today to learn more about our mud agitators. For quote request please provide the following information, Tank Dimensions, Mud Weight Range Horsepower, Impeller Size and Shaft Length. 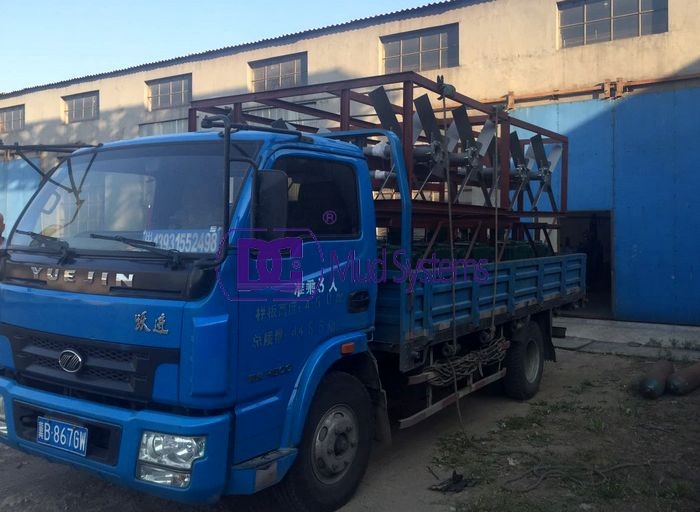 Drilling mud agitator, Supply drilling mud tank agitators for solids control system, DC drilling fluids agitator for mud system reliable quality,competitive price. Lightweight, but sturdy construction with the highest torque rating in the industry. Available in 10, 15 & 20 hp models. Oversized shaft bearings are used for longer gearbox life and lower maintenance requirements. Cast iron housings are one-piece, reinforced and ribbed for extra strength. Detachable impeller shaft for ease of servicing without disassembling unit. Simple mounting. 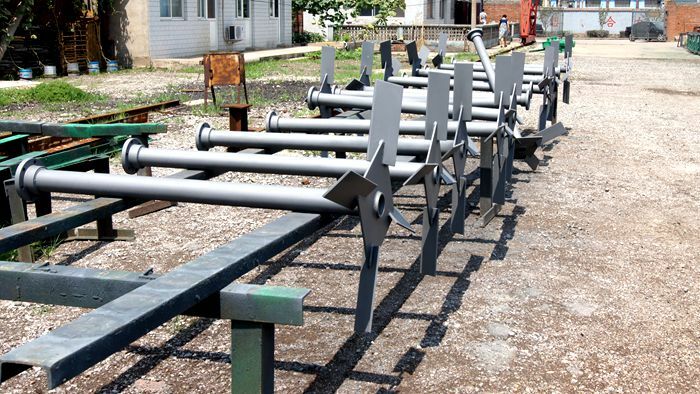 Mud Agitator base rests on tanks structural cross beams held by six bolts. If you are currently looking for good performance mud agitator and solids control equipment supplier, DC Solids Control is your best choice. Besides mud agitator, we also have advantage of shale shaker, decanter centrifuge, mud cleaner, desander, desilter, jet mud mixer, vacuum degasser, mud gas separator, flare ignition device, vertical cutting dryer, centrifugal pump, shear pump, screw pump etc. Looking forward to hearing from you! Drilling mud agitator is a device mounted on mud tank for agitating the drilling mud to prevent the drilled cuttings and fine solids from sedimentation. Nearly every large compartment of mud mixing and storage tank should be equipped with mud agitators to maintain the proper properties of drilling mud that will pump back to the borehole. DC Solid control mud Agitator Available in 5 -15 horsepower, our extreme-duty mud agitators feature the rugged and reliable gear box for long-lasting performance. Along with the gearbox, all our Mud Agitators include an explosion proof motor, impeller and shaft assembly. Solids control mud agitators are the mud mixers on Mud Tank. Including the horizontal and vertical type. That is meant by motor mounting direction. Nowadays, more and more users prefer the helical bevel geared agitator. Why? 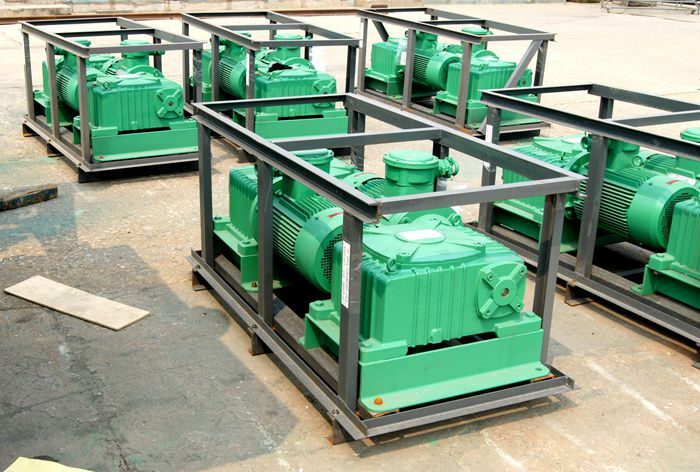 The helical bevel gear box will be more stable and reliable than the helical worm and wheel gearbox. The agitator is an important part of the mud solids control system. It is mounted on the circulating tank. Recent days. DC Solid control shipped 18 sets horizontal mud agitator to Pakistan drilling contract. Mud Agitator is usually used in mud mixing tank to keep mud unformity. The agitator is featured by compact construction, light weight, low noise and strong agitating power. 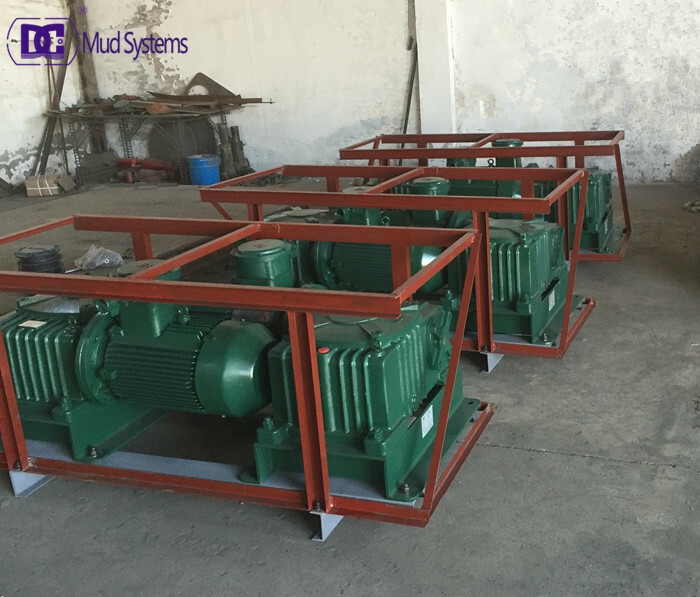 We provide mud agitators in different motor power from 5 HP to 30Hp or as per customers requirements.A mud gun is designed for use in a solids control system of a drilling rig. 1. Compact design. Quiet, smooth, vibration free. 2. Durable, single reduction worm gear drive. 3. Fewer moving parts, less maintenance. 4. Compact design without coupling,JIE top brand gear box. Please contact DC Solid control with your tank dimension and your detail requirement. We will recommend the right model with specification about the horsepower, impeller (size, type& quality), and shaft length etc to meet your requirement. To celebrate a new order of JBQ15 Mud agitator from a new clients of India. This is our first time to cooperate, in order to meet long terms business cooperation, we sold the agitators with lowest line price and fastest delivery times. DC Solids Control as a professional manufacturer for soilds control equipment, we have designed lots of high-quality products, and JBQ series Agitator is one of them. 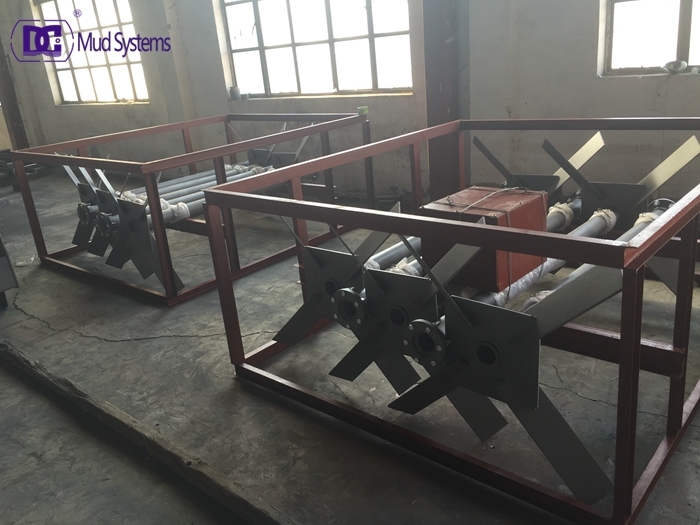 To keep both the mud uniformity and the suspension of solids, the mud agitator is used to agitate the mud consecutively and reliably. 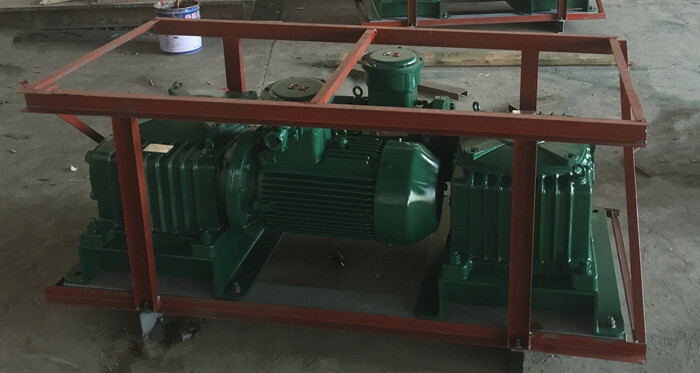 More than 7.5 kW Mud Agitator uses the turbo and worm gear speed reducer, with the large torque transmission、 the revolution is steady、it works reliablely and has great merit. Common model of mud agitator is JBQ5.5kW 、JBQ7.5kW 、JBQ11kW and JBQ15kW.The drilling mud agitator is an important components for DC Solids Control drilling fluids processing system. Please contact us today to learn more about our mud agitators, and please provide the following information, Tank Dimensions, Mud Weight Range, Horsepower, Impeller Size and Shaft Length that we can proposal reasonable one for you. Mud agitator is an important part of drilling fluid cleaning system which is mainly located on the tank surface to agitate the precipitation drilling fluid. The good news is, we got the satisfactory feedback of DCJBQ Series mud agitator from user drilling site. DCJBQ series mud Agitator, Less than 5.5 kW drilling mud Agitator adopts the blender cycloid speed reducer, and it is applied to the drug liquids mixing tank. This mud agitator has the advantage of compact structure so it occupies small area. 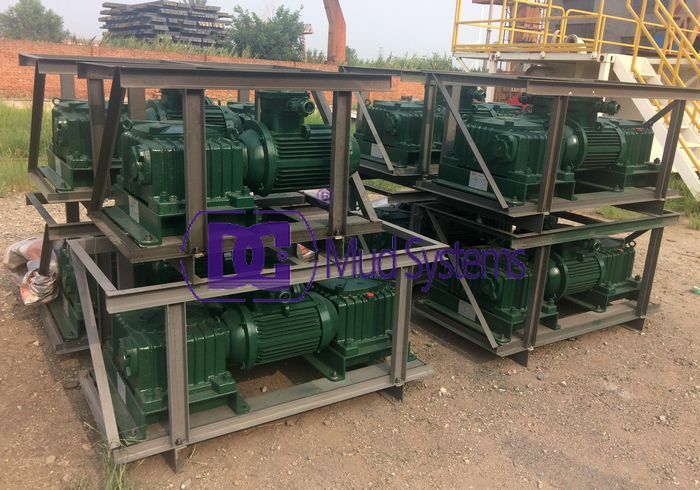 More than 7.5 kW Mud Agitator uses the turbo and worm gear speed reducer, with the large torque transmission、 the revolution is steady、it works reliablely and has great merit. 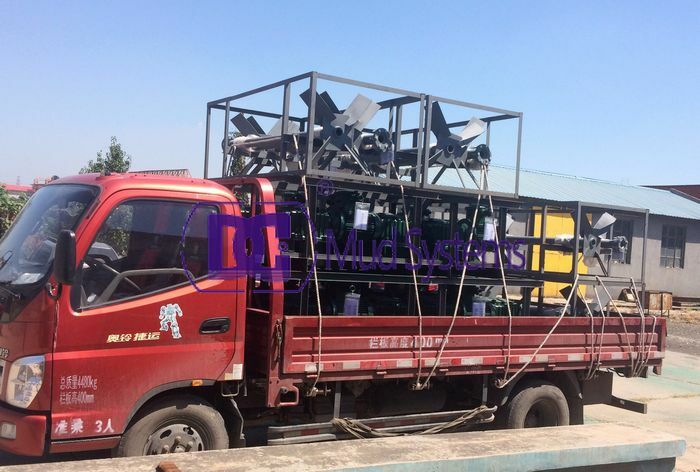 Common model of mud agitator is JBQ5.5kW 、JBQ7.5kW 、JBQ11kW and JBQ15kW. China manufacturer DC Solids Control offer the world with drilling mud agitator equipments.We are an exporter of drilling fluid mud agitator for Indian, Russian,middle east.etc..Our factory and company are Quality Management System ISO 9001-2000 certified. Mud agitator is the special agitating equipment in oil drilling mud circulating tank. Mud agitator keep drilling fluid uniformity and make the solid phase particles suspension. It is mainly used in drilling fluid mixing to prevent drilling fluid solid phase particles precipitate in tank type circulating system, also make circulating drilling fluid performance is stable, mixing is uniformity, it is the one equipment of the science drilling. Mud agitator should set in the place of centre of working volume level, the distance of impeller and tank bottom is the 1/3 to 1/4. 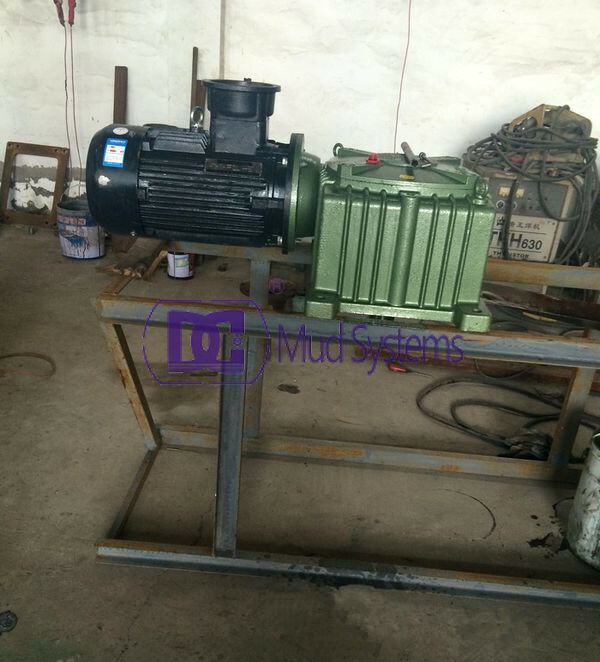 7.5 kW above mud agitator using turbine worm reduction drive, has the transmission torque, smooth operation, reliable work, etc advantages. 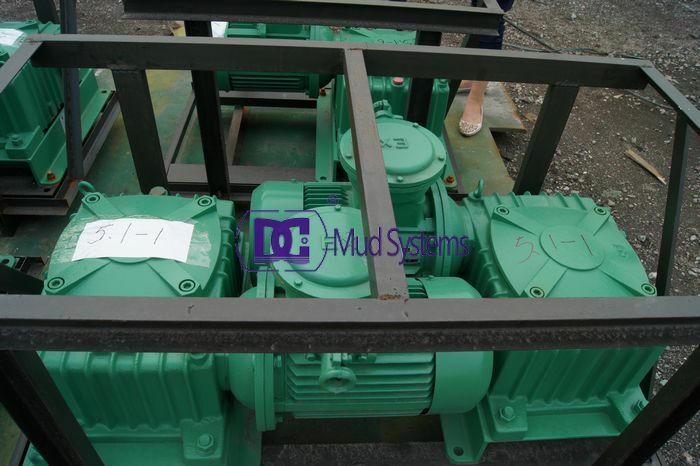 DC Solid control is the special mud agitator company, our company product design reasonable, structure is unique, use worm and worm wheel gearing-down device, has the advantages of transmit torsion is big, well stability and safety, service life is long, convenient to maintain and with the large agitating and discharging. 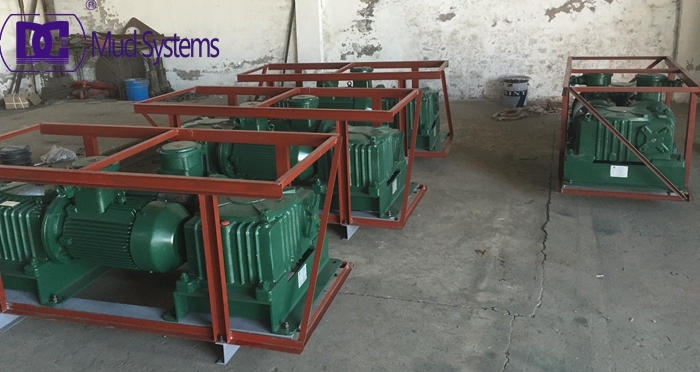 At the end of the Dec. DC Machinery finished h a order of 36 sets JBQ7.5 mud agitators for Indonesia clients who was already placed the second order of mud agitators from DC Machinery. The first order is 16 sets JBQ5.5 in the mid of 2014. 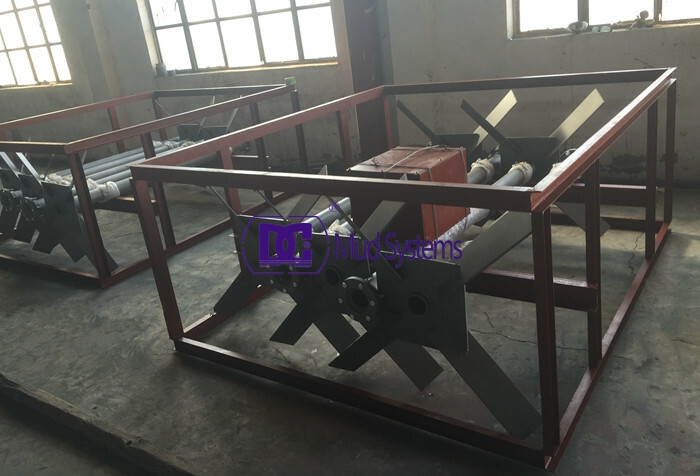 The clients thought our mud agitators have good performance, and lowest line price compared with other suppliers. The mud agitator, also called drilling mud agitator, used for drilling fluid agitation mix, prevent drilling fluid solid particles in the tank circulation system deposit, cycle drilling fluid performance stability, mixed evenly. 1. Mud agitator using circular cylindrical worm reducer, shaft section for the circular cylindrical worm, turbine profile for turbine phase conjugate circle. The bump tooth close reliable performance, high efficiency, compact structure. 2. The speed reducer and explosion motor combination, easy maintenance, suitable for harsh field conditions used. 3. The user can choose according to the site condition single or double impeller, according to the tank depth increase stirring shaft of centralizer. 4. Motor placed in a horizontal position, installation, adjustment, easy to change. 5. 7.5 kW above mud agitator using turbine worm reduction drive, has the transmission torque, smooth operation, reliable work, etc advantages. 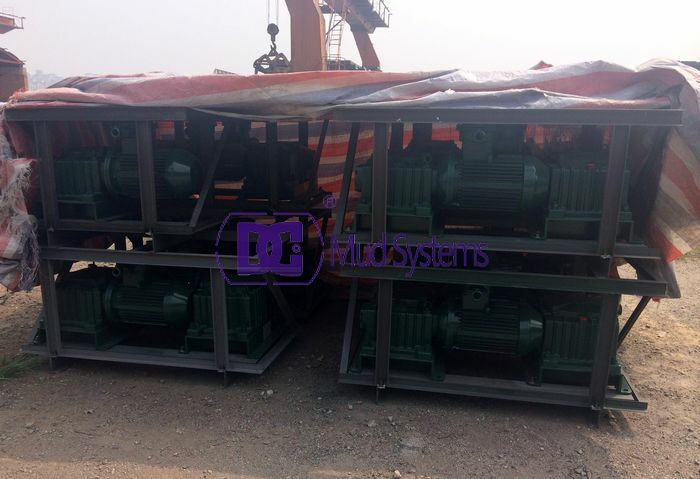 DC Machinery also can customize different type mud agitators, such as , vertical or horizontal, the length of the shaft, explosion-proof motor and ect. If you want to know more about it. Please feel free to contact us. DC Solid control company supplies oil & gas operators with industrial drilling mud mixer agitators for mud tank mixing. DC Solid control company mixing process quickly allows drillers and operators to ensure homogenous mud consistency for their drilling mud needs. The main mixing equipment of mixing system is the mud agitator. The agitator produces powerful, sequentially timed pulsed of compressed air to generate large bubbles at the bottom of the mud holding tank. The rising air bubbles create immediate vertical circulation of the drilling mud and stirs the entire mud tank from the bottom up. Accumulator plates are attached to the mud tank bottom and introduce the compress air bubble. The burst of compressed air from underneath the plate scours the drilling mud tank bottom and efficiently lifts solids and heavier liquids up into the tank. This “bottom-up” vertical mixing process keeps solids is suspension, ensures uniform mud consistency and level in the tank. 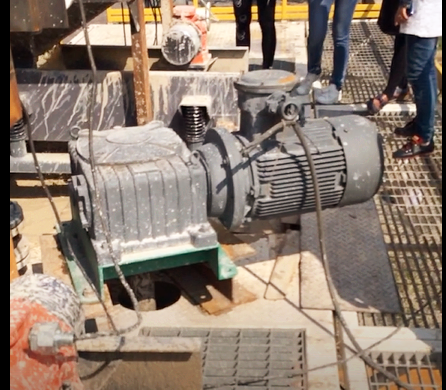 Our Mud agitator with belt transmission is simple structure, smooth transmission, low cost, slipping when overload occurs, play a role in protecting the motor. The reducer is single-stage worm gear , small structure size, light weight, smooth transmission, low noise, high transmission power. Please contact with DC solid control company with your tank dimension and your detail requirement. We will recommend the right model with specification about the horsepower, impeller (size, type& quality), and shaft length etc to meet your requirement. Industrial drilling mud agitators and mixing equipment for oil & gas exploration. DC Machinery Systems supplies oil & gas operators with industrial drilling mud mixer agitators for mud tank mixing. The DC Solid control mixing process quickly allows drillers and operators to ensure homogenous mud consistency for their drilling mud needs. The DC Solid control mud agitators produces powerful, sequentially timed pulsed of compressed air to generate large bubbles at the bottom of the mud holding tank. The rising air bubbles create immediate vertical circulation of the drilling mud and stirs the entire mud tank from the bottom up. Accumulator plates are attached to the mud tank bottom and introduce the compress air bubble. The burst of compressed air from underneath the plate scours the drilling mud tank bottom and efficiently lifts solids and heavier liquids up into the tank. This “bottom-up” vertical mixing process keeps solids is suspension, ensures uniform mud consistency and level in the tank. This type of drilling mud mixing process is faster and more energy efficient than top entry mixers or jet mixers. Regardless of the holding tank geometry or hull design, the drilling mud agitator can be custom designed to fit any size drilling mud mixer to help improve the overall efficiency of the drilling site.